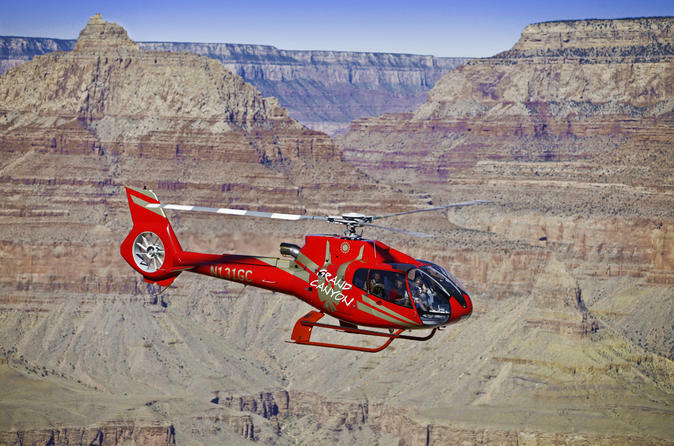 See the West Rim of the Grand Canyon from an aerial perspective during a scenic helicopter tour from Las Vegas. Travel in style with luxury hotel transport and get incredible photo ops from the helicopter's wrap-around windows as you soar above the landscape. Marvel at Hoover Dam’s Lake Mead and the green ribbon of the Colorado River winding from the depths of the Grand Canyon’s sculptured sandstone walls. Choose from several daily departures from sunrise to sunset! Upon pickup from your Las Vegas hotel, approximately one hour before your flight, settle into your limousine and head to either McCarran Atlantic Terminal in Las Vegas or Boulder City Municipal Airport, depending on your selection when booking. After check-in at the private heliport terminal, swap your limo for a state-of-the-art helicopter. Take a comfortable seat next to wrap-around windows that grant you prime aerial views, and listen to expert narration on board. Once airborne, your 90-minute round-trip flight follows a scenic route east to the Grand Canyon. Fly over the Hoover Dam, which holds the largest body of water in the Southwest—Lake Mead. Then soar above the Grand Canyon’s astounding West Rim, and look down on the meandering Colorado River and viewpoints such as Guano Point and Eagle Point, home to the glass-bottomed Skywalk. Snap photos of the rugged beauty as you pass through millions of years of geological time. During the return flight to the city, take in the neon lights of the Las Vegas Strip before landing back at the heliport. Then reboard the limousine to end your tour with hotel drop-off. Special Offer - Book by May 31, 2018 and save 11% compared to another travel site! - Book Now!